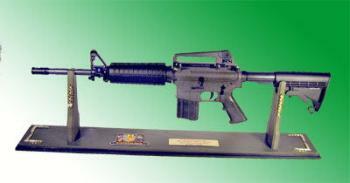 U.S. M4A1 Carbine on Board display [GUN-079] - $285.50 : Metalcraft by Blair - military gifts and memoribilia. These gun displays make a great presentation, a really neat gift. WARNING, WARNING, Do not carry them out in public, the Police might shoot you, they look that real. What a neat way to Say thanks for a job well done, or present to the past president of your club or association, how about fund raiser of the year, or for most new members enrolled.